Bestsellers and niche titles alike have helped CliftonStrengths spread to all corners of the world. Learn more about the books that have brought the power of positive psychology and strengths psychology to millions of people in thousands of organizations. Published in 2007, StrengthsFinder 2.0 brought the power of strengths-based development to the masses. This international bestseller asks a simple yet profound question: Do you have the opportunity to do what you do best every day? The book proves why doing so is critically important to helping people succeed in every facet of life. That’s the subtitle to Soar With Your Strengths (1995), Don Clifton’s pioneering work that brought his science of strengths psychology to the public. Throughout the book, Clifton establishes the basis upon which the CliftonStrengths movement would grow. The premise is powerful: Companies, leaders and those they lead can achieve more by focusing on strengths rather than on weaknesses. But it wasn’t until Now, Discover Your Strengths (2001) that Clifton paired a book with the CliftonStrengths assessment. The result was a revelation: For the first time, individuals in any walk of life could discover their strengths using the online assessment. Organizations, too, outfitted their managers and teams with Now, Discover Your Strengths, hoping to achieve the benefits of building the strengths-based culture defined in the book. As more and more organizations were bringing strengths to their teams, Gallup published StrengthsFinder 2.0 in 2007. The book offered unprecedented research into the power of strengths development, as well as access to an updated version of the CliftonStrengths assessment. StrengthsFinder 2.0 now sits on shelves in workplaces and offices around the world as a go-to guide for how to get the most from employees and teams by focusing on what they do best. In an interview with The New York Times, Facebook Chief Operating Officer Sheryl Sandberg recommended Now, Discover Your Strengths as the best business book she’d read in recent years. Gallup followed the success of StrengthsFinder 2.0 with a book that set the management world ablaze. The book also introduces the concept of the four domains of leadership strength, research that's paved the way to great accomplishments for leaders around the globe. Strengths Based Leadership is only one example of books that position strengths psychology as the catalyst for achieving positive impact on success in a role or responsibility. Strengths Based Selling (2011) combats an entire industry of sales training material, eschewing the traditional ideas that someone can be taught to sell just like the next salesperson. Instead, Strengths Based Selling describes how salespeople can get their best results by truly understanding and building on who they naturally already are. Similarly, Strengths Based Parenting (2016) doesn't prescribe one right way to parent. This book positions the power of strengths discovery and development in the world's most important workplace: the home. Strengths Based Parenting gives readers inspiring examples and proven techniques for using strengths development to improve relationships throughout the family. 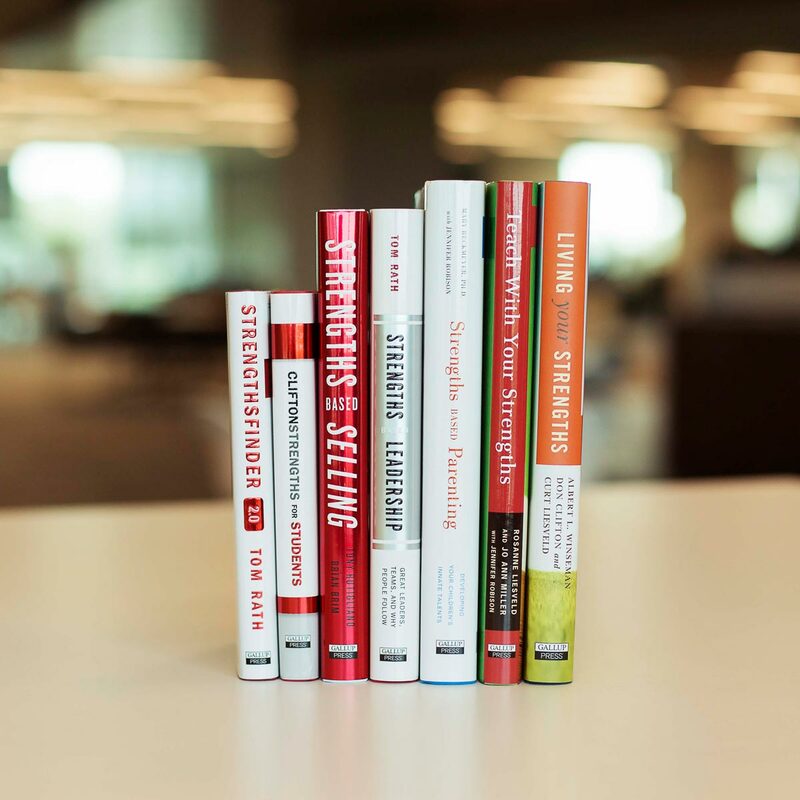 These role-related CliftonStrengths titles bring concepts and science to life for individuals charged with accomplishing great things using their natural talents. The idea that people should focus on using their God-given talents to live their best life just makes sense. So, too, does the notion that students can achieve greater performance in school and after graduating when schools help them discover and apply what they naturally do best. 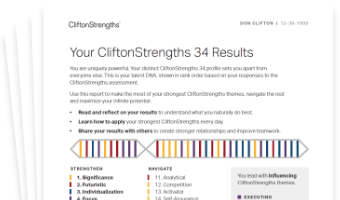 It’s not surprising, then, that millions of people have been introduced to CliftonStrengths through their faith communities and their schools. Living Your Strengths (2004) shows people how to find their talents and use them to fulfill a greater purpose. Teach With Your Strengths (2005) gives educators a detailed look at what great teachers do differently, including how they focus on students’ strengths instead of weaknesses. StrengthsQuest (2002) and the new CliftonStrengths for Students (2017) provide colleges with a guide for focusing on talents and strengths to develop engaged and thriving students, on campus and beyond.